Three generations of the Diprose family have grown a highly respected earth moving business from a one-man contracting operation in 1955. Gradco Pty Ltd (originally Gradall Constructions) was established when an enterprising 35-year-old Tasmanian, Dak Diprose, imported what was at the time a revolutionary all-hydraulic rubber-tyred Gradall excavator from the US. Dak’s successful introduction of the first complete Gradall machine into the Southern Hemisphere, was in these days a huge gamble - which paid off. The machine boasted a rotating bucket - giving previously unmatched power and versatility, resulting in its widespread use throughout Australia during the 1960s. In 1968 Dak’s son, Robert Diprose, joined the business and a second Gradall, fitted with tracks, went to work digging drainage channels on British Tobacco’s giant Rushy Lagoon property in north-eastern Tasmania. Major changes in the earthmoving industry in the 1970s prompted Gradco to diversify into other types of earthmoving equipment, with father and son working in partnership until Dak’s retirement in 1976. During the 1980s and ’90s Robert and his wife Alison enjoyed steady growth, which saw them become one of Tasmania’s larger plant hire/contracting businesses. 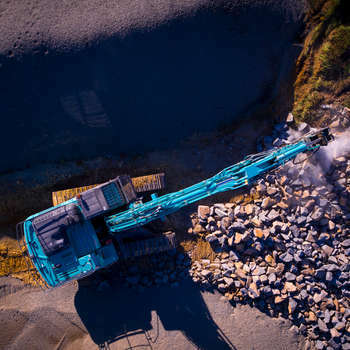 With the focus mainly being around hydraulic excavators using specialised attachments, low loaders and tip trucks became a natural extension of the ever-growing fleet. During these years, Gradco carried out various projects from large water storage dams, farm drainage, open cut coal mining and various different civil contracting projects. Another turn in Gradco's direction came in the late 1980s when Robert and Alison made the bold move of purchasing two new Moxy articulated dump trucks. The introduction of articulated dump trucks meant the end of scrapers - which had proved to be limited to seasonal work - in many applications. With these versatile new 6x6 all-terrain trucks, Gradco found itself able to work all year round. The fleet continued growing, and many different types of equipment, such as dozers and graders joined the fleet. Diesel and dirt were heavily engrained in the Diprose family by now; from a very early age Robert and Alison’s sons Oliver, Tom and Will were all working in the family business at any opportunity. With the rules and regulations being slightly different in those days, school holidays and weekends were spent by the boys travelling with Robert in the low loader and later operating equipment whenever the chance arose. Oliver joined Gradco in the late 1990s after spending time working in the industry interstate and overseas, followed by Tom in early 2000 after also working interstate in the industry. In 2005 Will also joined the family business after serving in the Australian Army. With an ever-changing industry, the need to move with client’s needs and exceed their expectations brought on some of the most significant changes to Gradco since the 1980s. Safety, Qualitity and the Environment were now a far higher priority in the industry, so the third generation of Diproses really embraced these concepts. In 2002 Gradco implemented the Civil Contractors Federation’s Integrated Management System (IMS) - which provided a pathway to full accreditation to Australian and International Standards. The processes and procedures required by the CCF IMS were implemented right across the business, and in a short space of time transformed the company’s culture and outlook. With management systems and the company culture evolving continuously, additional opportunities presented themselves. In a very short period of time, Gradco became a serious player as one of Tasmania’s leading civil/mining contractors. As a result, Gradco and its management team enjoyed steady growth throughout the first decade of the 21st century. But evolving industry demand and community expectations meant Gradco had to change yet again. In 2010 with the help of a dedicated management and advisory team, Gradco achieved ISO accreditation for its Safety, Environmental and Quality Systems. This gave Gradco the structure it needed to become one of Tasmania’s leading contracting companies, setting the highest standards across the industry. Gradco followed this up 5 years later in early 2015 by applying and achieving accreditation status in the Australian Government Building and Construction Accreditation Scheme. Today, Gradco is a diversified mid-tier civil/mining contractor with a structured management team and a dedicated team of supervisors and employees. We are recognised as a market leader with works across Tasmania and into mainland Australia. From our very small beginnings with one man and his pioneering Gradall back in 1955, Gradco has continued to change with the needs of the industry. We have always been there for our clients and employees - now for over 60 years. Today, Gradco is operated by Oliver, Tom and Will Diprose and boasts a large fleet that includes excavators, articulated dump trucks, bulldozers, graders, rollers, bulk and heavy haulage units - as well as two current model Gradall excavators - the machines that started it all. A fourth generation is now on the ground in Tasmania - also with diesel and dirt in their veins - so the Diprose family and Gradco look forward to being a big part of this industry for some time to come!